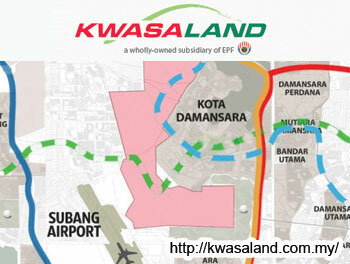 KUALA LUMPUR (Oct 15): Kwasa Land Sdn Bhd, a wholly-owned subsidiary of the Employees Provident Fund, today released the names of 23 Bumiputera companies selected as its potential partners for a residential development in its upcoming Kwasa Damansara township. Kwasa Land said 152 companies had participated in a pre-qualification exercise last year, of which 70 submissions were received for the Bumiputera category. The selection of the 23 developers is part of the company’s first Bumiputera initiative known as ‘R3-2’ in which 8.79 acres of land located at the northern part of Kwasa Damansara next to the MRT station have been allocated for residential development by Bumiputera developers. This tract of land is part of the 35% of land in Kwasa Damansara which have been slated for Bumiputera developers, Kwasa Land said in a statement. “Bumiputera initiatives form a significant part in the development of our proposed Kwasa Damansara township. Kwasa Land is pursuing this pathway in the interest of developing Bumiputera equity ownership in the corporate sector as well as asset ownership from strength to strength,” said Mohd Lotfy Mohd Noh, Kwasa Land managing director. “We are committed to support the Bumiputera Economic Empowerment Agenda call by targeting more than a third of our land allocation to Bumiputera companies,” Mohd Lotfy added. The 23 pre-qualified developers are Ahmad Zaki Sdn Bhd, Apex Communication Sdn Bhd, Ark Resources Berhad, Dwitasik Sdn Bhd, Faber Union Sdn Bhd, Fairview Development Sdn Bhd, Impiana Land Development Sdn Bhd, ISY Sdn Bhd, Johawaki Development Sdn Bhd, Lebar Daun Development Sdn Bhd,Getrahome Sdn Bhd, Prima Nova Sdn Bhd, Purplestar Land (M) Sdn Bhd, Kinta Berkat Sdn Bhd, Selia Selenggara Sdn Bhd, Sensatimur Sdn Bhd, Seri Meraga Properties Sdn Bhd, Sharikat Permodalan Kebangsaan Berhad, Swasta Setia Holdings Sdn Bhd, Triplc Bhd, Tujuan Gemilang Sdn Bhd, UDA Holdings Bhd and Zikay Group Sdn Bhd. The 23 developers who have been selected are said to be “the best potential partners to work with Kwasa Land”.